As the new year resolutions slowly fade and your workouts don’t seem as relevant as when you started in January it is time to ramp it up and try something new. Power equals strength multiplied by time. Therefore if we increase the speed of our lifts we increase our power output. This has many applications for life and when done correctly, can give you more benefit than any other exercise. These are advanced moves that incorporate muscular and cardiovascular strength and endurance into one activity. In essence this is exactly what is required to perform well in sports, and power moves connect that last piece of the puzzle between building strength and applying it in a real life situation. Also, for those of you who just want to burn calories and look great there is nothing better. How many overweight athletes do you see? 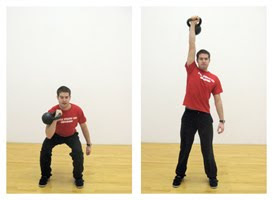 The Kettlebell is a great tool for these exercises. Its design lends itself to dynamic power moves with a unique blend of strength and endurance. The first move is the kettlebell swing. Start standing a foot or two behind the kettlebell, sit back making sure you fold at your hips with a straight back and take a hold of the handle with both hands. Keep your weight on your heels. Hike the kettlebell between your legs and behind you fairly close to your groin, drive the hips forward and start swinging. At the top of the swing everything should be tensed, your glutes, quads, core and lats. Relax on the way back down and repeat the movement always driving with your hips and never lifting with your arms. The swing provides an intense load to the hips. Power in the hinging movement created at the hips transfers directly to sports requiring running, jumping and throwing. Nothing trains this better than the swing. 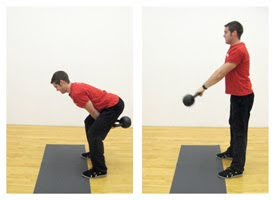 You can swing a kettlebell between your legs and behind you, something you can’t do with a barbell or dumbell. Also the shape of the kettlebell puts the center of gravity outside your hand adding to the difficulty. The deceleration component at the bottom of the swing builds muscle fast and is found in all sports. Secondly, we have the push-press. The goal of the push press is take that strength you’ve been building in your squat and turn it into a powerful move that propels a weight overhead. This can be done with a kettlebell, dumbell or barbell. The key is to transfer the power from your legs to the weight so that it just floats above your shoulder then you catch it. In this way it should not be like a military press at all and if done correctly you should be able to do it with more weight than you are comfortable pressing overhead. Finally we have the burpee. From standing position squat down until your palms touch the ground. Then go back into a pushup position do a full pushup and spring up from the ground onto your feet as quick as possible, then jump as high as you can into the air reaching for the sky. This will build power in your arms and legs, as well as giving your heart a great workout. As I said in the beginning, these moves are for the more advanced exerciser. They take time and practice to learn correctly but are well worth the effort. I believe anyone can learn these exercises with proper practice and instruction. Contact a personal trainer if you have any questions on how to perform these exercises.